New for 2016, the Honda Pilot gets a dramatic exterior restyling with its customary boxy shape replaced with sculpted curves. With the plunge in gas prices, few automakers seem better positioned than Honda with its array of utility vehicles, and one of those is getting a major update just in time for the Chicago Auto Show. The first eight-passenger SUV in a mainstream segment has also been one of the market’s hottest utility vehicles, with sales of 1.4 million since it launched in 2002. But where the first two generations stuck with a traditionally boxy design, the new Pilot is making what Honda officials are describing as a “dramatic shift” in styling while also moving a bit more upscale. “I guess you could say we were thinking outside the box,” joked chief engineer Marc Ernst, as he pulled the wraps off the new model. The 2016 Honda Pilot gets a bit more curve to its silhouette, with a creased hood designed to emphasize its power, and more sculpting to its fenders and doors. The nose picks up more of a three-dimensional approach to the Pilot’s triple-bar grille and more aggressive fascia. 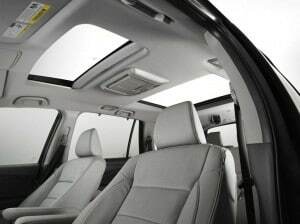 The 2016 Pilot can be ordered in either a seven- or eight-seat configuration. Overall, the new model stays close to the dimensions of the gen-2 Pilot, picking up just 3.5 inches in length. 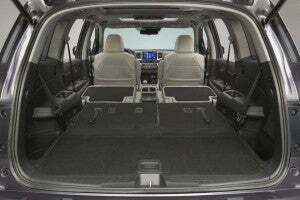 Most of that goes into the cabin, and the added inches make it easier to gain access to the third row, especially with a new one-touch second-row seating design that’s easier to fold out of the way. Like the outgoing model, the 2016 Pilot can be ordered in either seven- or eight-seat configuration, depending on whether you want that middle row with a pair of captain’s chairs or a bench seat. Inside, there are more soft touch materials, and such niceties as an 8-inch touchscreen, as well as a 4.2-inch multi-information display. Honda has updated the available navigation system for the new model, with such features as a 3D rendering that offers a virtual display of what a motorist will actually see. To keep the kids occupied, there’s also an updated, ceiling-mounted 9-inch video entertainment system for the back two rows that now can run Blue-Ray discs. And there are five separate USB ports, four offering fast charging capability. The new Pilot adds even more storage space, including what Ernst described as a “tech locker” in the center console that can stow tablet computers or a purse. There’s also a purse shelf between the front seats. 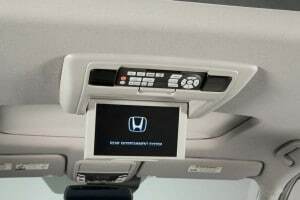 To keep the kids occupied, there’s also an updated, ceiling-mounted 9-inch video entertainment system for the back two rows that now can run Blue-Ray discs. Under the hood, the 2016 Pilot comes with an updated 3.5-liter Direct Injection iVTEC V-6 that can shift to three-cylinder mode when power demands are light. That reduces fuel consumption, the maker claims, as does the available Stop-Start engine technology. However, Honda is holding specific engine power and mileage numbers until closer to launch. What it does say is that buyers will have the choice of two engines, a base model six-speed automatic and a more efficient nine-speed on mid and up-level trims. Further aiding fuel economy, Honda engineers were able to carve about 300 pounds off the new Pilot compared to comparable versions of the old one. As before, buyers will be able to choose front- or all-wheel-drive. A new AWD control system is designed to act even before the wheels start slipping on snow, ice or other slick surfaces. From a safety standpoint, the new ute will pick up a variety of new features, including Forward Collision Warning and Auto Braking, Rear Cross Traffic Alert, Lane Watch and Honda’s unique, camera-based Blind Spot Warning system. Active Cruise Control also can be ticked off on the option list. The overall look and feel of the 2016 Honda Pilot is a more refined and pricey – though Honda officials declined to say whether the 2016 Pilot will move up from its current starting MSRP of $30,750 in front-wheel-drive trim. The new model stays close to the dimensions of the gen-2 Pilot, picking up just 3.5 inches in length. Considering the hefty competition in the market, however, it’s unlike the Japanese maker can hit buyers with more than a relatively modest increase, even with the long-running loyalty of the ute’s buyers. If anything, the more sophisticated look of the Pilot could pose a bit of trouble for Honda’s sibling brand, Acura. That marque’s MDX ute is based off the same platform as the Pilot and the gap between the two models appears to now be a lot narrower. 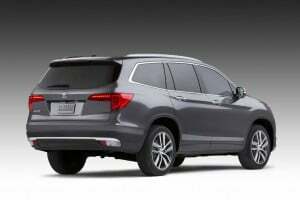 The new 2016 Honda Pilot will have a big legacy to follow when it comes to market later this year. Even in its final year, the outgoing model delivered record sales, and was one of the tough-sellers in the U.S. SUV market. Honda is hoping that will give it even more momentum with the third-generation Pilot.